Merry Kohn was born on December 26, 1951 in Fort Meade, Maryland. Being the daughter of a military officer, and the proverbial "army brat," Merry traveled the world over with her family. Her many experiences abroad stirred her creative side and she began painting at an early age. Merry Kohn Buvia now makes her home on the beautiful Monterey Peninsula, yet you can see the influences of her travels through Europe, the Orient and the United States evident in her work. Having painted all her life, Merry is basically a self-taught artist and paints with a whimsical, yet uncompromising wit. The titles of her paintings usually indicate a joke or a story that has to be searched for in the canvas. Collected internationally, Merry's work has been shown across the United States, in Japan and Korea. Critics and audiences of naïve art have compared her to Michel Delacroix, Yamagata and Wysocki. Munsingwear commissioned her in 1986 to do the cover of their centennial annual report and, later that year, to do the poster for their Annual Munsingwear Bicycle Race in Crested Butte, Colorado. 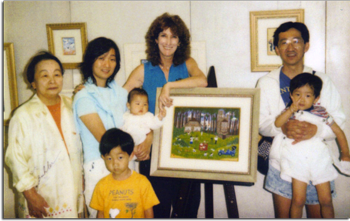 She has been displayed in the Sonje Museum of Contemporary Art with artists such as Grandma Moses, Henri Rousseau, Ivan Rabuzin and Mattie Lou O'Kelley. Her work was exhibited in a group show, at the Chicago Center For Self-Taught Art. 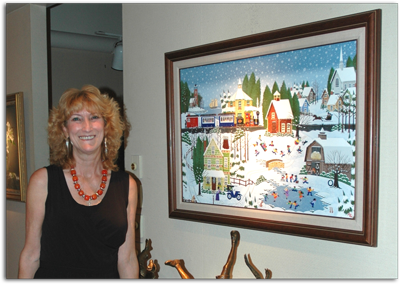 She has produced puzzles, calendars, mugs, greeting cards and other items for many companies including Hallmark. In 1993, Merry's wonderful design "Made in Paris," was selected at the European Workshop to be used by UNICEF as a 1995 Christmas Advent Calendar. It was also selected as a Christmas card. In 1998, they produced four of her images into cards. In 1998, she was commissioned by the internationally renowned, Monterey Bay Aquarium, to do three paintings to be made into a gift line for their stores. For 1999, and again in 2000, Hallmark produced an advent calendar from one of her snow scenes. And in 2009, a Christmas card. Bit & Pieces puzzle company has, over the years, produced many jig-saw puzzles from her images. In 2003, 2004 and 2005, she went to Japan to do several very successful shows of her paintings, for the Osaka company, Ecóle de Paris. The trips involved traveling to such cities as Tokamatsu, Tattori, Kobe, Osaka, Nara, Kyoto and Yokosuka. It was the experience of a lifetime. In 2008, she was requested by the Monterey County SPCA to do a painting for their Wag n' Walk poster. That original was donated to them as the grand prize for the fund-raising event, as were two additional miniatures for second and third prizes. The happiness of childhood is recaptured in every canvas. Not one person's particular childhood, but an archetypal, idealized childhood in which we collectively share. One critic once wrote, "The feeling evoked are those of the pictures of old story books: a trace of deja vu, of daydreaming on a golden afternoon as the shadows lengthen." "Know you what it is to be a child?... it is to believe in love, to believe in loveliness, to believe in belief; it is to be so little that the elves can reach to whisper in your ear; it is to turn pumpkins into coaches, and mice into horses, lowness into loftiness, and nothing into everything, for each child has its fairy godmother in its own soul."